Fahey’s Children Win The Pennant!!! There was a buzz in the Dedans as the night began. King and Lewis were warming up – the stage was set for the 2017 pennant final! The game commences first blood to Lewis 1-0, King rises to the challenge making the most of the handicap and playing some beautiful shots 1-1. Lewis loses the 3rd game King leads 2-1, King takes a lead in the 4th but Lewis fights hard retrieving it from 40 love down 2-2. King is not disheartened and plays some great defensive tennis and then takes his opportunities 3- 2, King leads again 40/15 but Lewis again fight back to make 3-3. King takes the next 4-3, Lewis looks exhausted gasping for breath and again King is leading but yet again Lewis battle on 4-4. Momentum seems to shift and Lewis starts to lead, the tennis is sublime both playing well but Lewis pushes into the lead 5-4 and then powers his way over the line for a 6-4 victory to seal the first match. Castellino in demonstrating remarkable control takes the first two games, Ward is making very uncharacteristic mistakes. Ward finds some form making it 2-1. Castellino serving well stretches the lead 3/2. Castellino pushes on, Ward is still making errors questioning himself 4-2 Castellino. Castellino making the handicap work for him pushes ahead, Ward looking frustrated . Suddenly Ward finds his form and pulls a game back 5-3 again. Castellino manages to keep the momentum playing some great tennis and takes it 6-3. Johnston off to a flyer playing well and Roberts has no answers, nerves are getting the better of the YBBTR captain, will he lose to love he finds a little form 3-1 and again Roberts seems to be fighting back 3-2. Johnston hold his form Roberts has lost himself and his footwork – he is all over the show Johnston pull ahead 4-2 and then 5-2 and then 6-2 no real resistance from Roberts in the face of Johnston’s error free tennis. The young duo hold their cool putting the pressure on. Castellino and Lewis battle hard but some great tennis and a few errors and they fall 6-3. Students need to win 6-4 to take the championship 6-5 would be a draw!! The final set all still to play for playing off level. Ward and Johnston are under pressure Castellino and Roberts serve well and play steady tennis and errors are being made by the young gun, Roberts and Castellino are suddenly 4-1 up only needing one more game to ensure a draw. Ward finds his form and battles with Castellino everything comes back and now it is Castellino and Roberts making the errors, momentum shifts 4-2, 4-3 4-4 the crowd is cheering the students on, the students take the lead 5-4 only needing one game to clinch the victory and displace the 5 time winners. Roberts and Castellino find their composure and are 40-15 up, but the students refuse to accept defeat 40-30 40-40 and then Ward pushes back and Castellino digs a ball out but only can find the net the match is over and an era has ended – student victorious!! Roberts has not only lost his tooth but his foot work and touch failed him. A deserved victory and congratulations Fahey’s children and thanks to a great set of supporters who added an extra dimension to an enjoyable final. Special thanks to Chris and Seth for some exceptional marking! This was shown by Ward and as agreed by both captains man of the match although the set of the match was definitely the awesome battle between King and Lewis – sublime tennis! The Pennant Season is coming to an explosive end. Can A Yard Better Than The Reste cling on to their title? The final of the Thursday night Pennant is this coming Thursday night!! We have a fantastic final match after an exciting and hard fought regular season. Five time champions a Yard Better Than The Reste (staff team) have bulldozed their way to championship after championship lead by the colourful Simon Roberts. He has constantly stated that his team cannot be defeated and he has been proven correct. However this season Fahey’s children (student Team) lead by departing student captain Josh King have stamped their authority and won the regular season comfortably. Can they keep their form going for 1 more night?? Or will the Roberts machine claim 3 more victims in its path of destruction. Please come down and support both teams, it should be a colossal final! 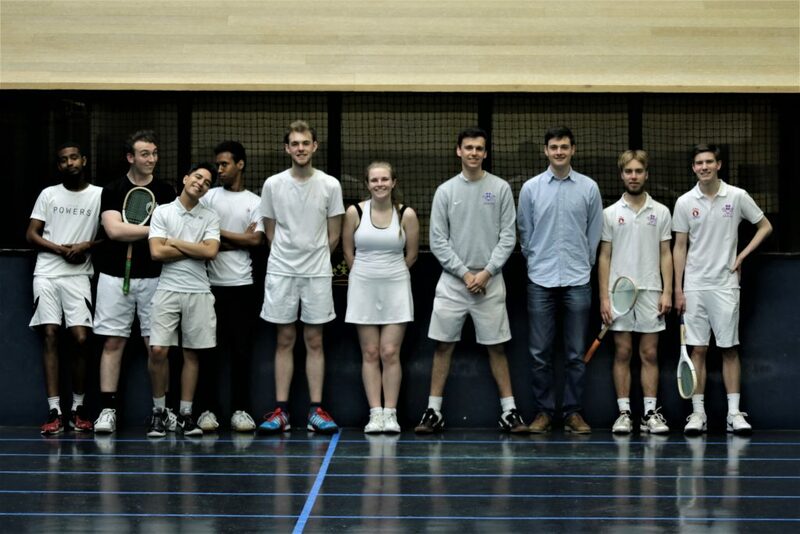 Middlesex Students defeat Durham University in epic contest!! 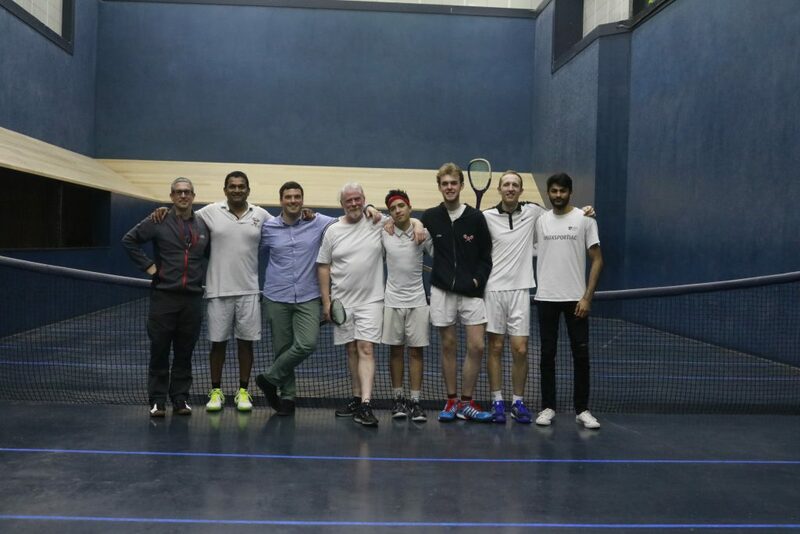 On Thursday 13th of April, Middlesex University played Durham at MURTC in what now seems to be a yearly fixture. The day was hard fought by both sides, with Middlesex managing to win 5-4. First up on court for MURTC was Connor Holmes against Georgie Lacey-Solymar. It was a tentative start from Connor, making some uncharacteristic errors which cost him heavily on the owe 15 receive 15 handicap. Georgie played well and took an early lead, which proved to be too much for Connor. Georgie wins it 8-4. Second up was Sam Asgedom against Durham’s Harry Knowlton. Unfazed by the tricky and fast pace of play, Sam’s relentless retrieving shone through and he went on to take the match 8-5. Lennox “The Hurricane” Johnston took to the court to face Durham’s Charlie Drew. No stranger to the Middlesex court, Charlie produced excellent serving to keep pressure on his opponent. Lennox however found his range from the start, producing intelligent tennis and taking an early 6-0 lead. This proved to be too much and he went on to take the match 8-2. MURTC’s student intern Georgina Allen now stepped up to play George Skinner. Both talented Lawn Tennis players, it was clear this game would be a tussle. The match went point for point in one of the more intense matches of the day. Both sides played fantastically, but with consistent play and great shot selection, Georgina went on to win 8-6. 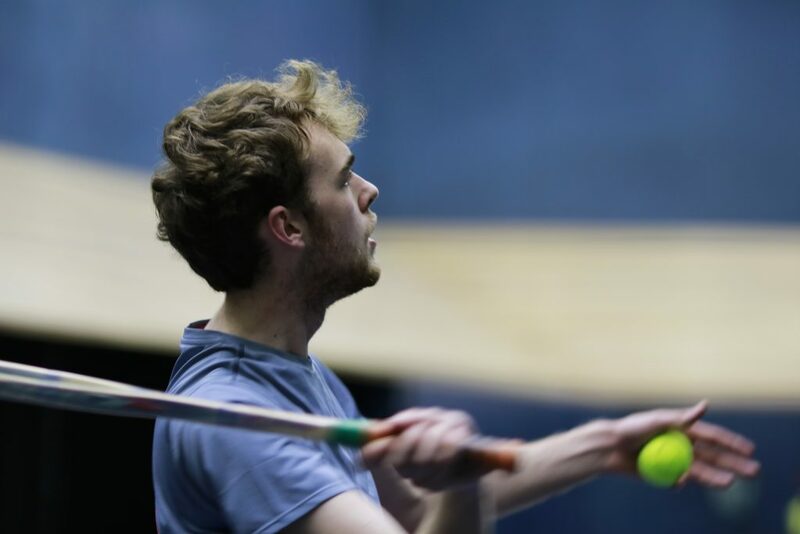 Najib has had an impressive year, dropping 30 handicap points since picking up a racket in November, had he met his match in Durham’s Matt Brooks? Spectators could tell that this was going to be hard fought from both sides. The two started well, exchanging impressive rests and covering the court well. Matt soon found his feet on our bouncy court and was able to adapt his rackets skills, using the main wall to create some uncomfortable angles for Najib. Matt went on to take the match 8-3. Last up, Josh King to play Oliver Taylor. The unfamiliar court caused some problems for the Durham player at first, falling behind 4-2. As the match went on, Oliver upped his game and found good length, winning the match 8-5. Middlesex went on to win two of the three doubles. The best night of the year approaching soon. The Real Ten announced on 17th May. THE REAL TEN is back!!! The biggest night of the year at Middlesex University is coming up on Wednesday 17th May!! The Real 10 is back!! We are really looking forward to a packed house this year and we have put together the best line up ever for the event and for your pleasure. 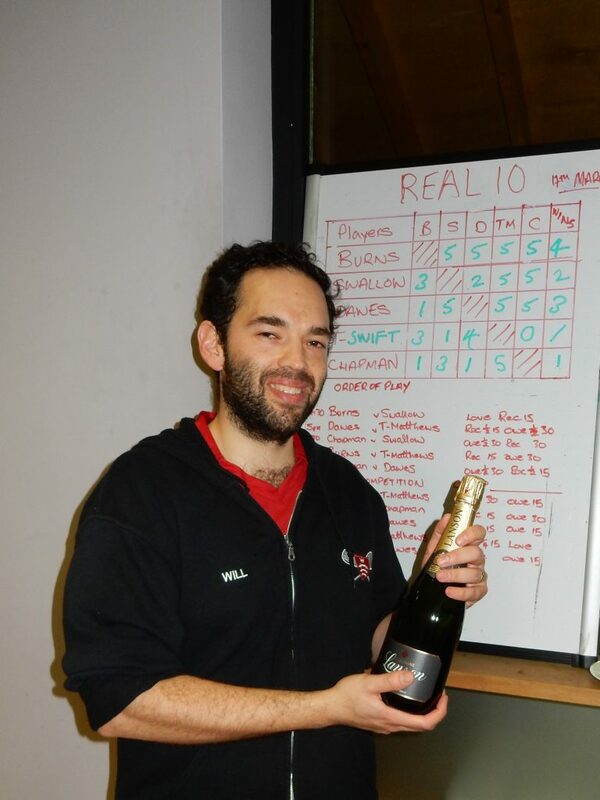 The format is as follows – Five professional play each other (off half handicap) in a round robin format with the top player taking the title. Tickets are £25 each but they are also a bet so if you back the right player you get £50 back. Included in the ticket is a buffet dinner and a free glass of champagne on arrival. Ben is the Head Professional at Leamington. He plays off +6 handicap and is the current world number 4. He is well placed to challenge for the World Championships next year and is currently British number 1. Chris is the senior Professional at Hampton Court, he is currently the world number 5 and plays off +5 handicap. He will also be in contention for the world championships next year and is a fantastic competitor. Bryn is the Senior professional at Queens Club and is currently world number 6. He plays off +6 handicap and is renowned for his double backhand. He has also won two grand slams in his distinguished career defeating the legendary Rob Fahey and talented Steve Virgona in the British Open and US open. Jon is the Head professional at Hatfield House. He currently plays off 5 handicap and is famous for his classical game. He has won this title before and has experience on his side, a tricky customer. Will is the Head Professional at Middlesex University. He currently plays of 8 handicap and is the defending champion. He has won this title on 2 separate occasions and is looking for a hattrick of victories. This is your chance to see some of the best players in the world at your club!! Don’t miss out!! Play kicks off at 4.30pm and goes on until 10pm. Please join us for a great night of tennis and socialising.